1 Rodgers does note a key qualification that Nozick built into his theory: if the original distribution of goods violates free-market principles—as in a slave society—then all that follows is unjust as well. At this point in Nozick's system, Rodgers observes, “history brought logic to a stop” (190). 2 Rodgers, Daniel T., Contested Truths: Keywords in American Politics since Independence (New York, 1987). 3 On this point, see the reviews of Age of Fracture by Michael O'Brien (Times Literary Supplement, 29 July 2011, 8–9); and Lisa Szefel in the History News Network website, HNN, 24 Feb. 2011; and the follow-up discussion in the blog of the Society for US Intellectual History, 4 March 2011, at http://us-intellectual-history.blogspot.com/2011/03/szefel-on-age-of-fracture.html. These reviews came to my notice after my own was essentially completed. 4 By contrast, Rodgers's Atlantic Crossings: Social Politics in a Progressive Age (New York, 1987) is a pathbreaking cross-cultural study. On this point, too, see Michael O'Brien's TLS review. 5 Quoted in Dumenil, Lynn, The Modern Temper: American Culture and Society in the 1920s (New York, 1995), 11. 6 Returning later to the differences between “vulgar” and “philosophical” pragmatism, Kloppenberg notes that sometimes “it can be hard to distinguish in practice between the two” (193). 7 A comparison of how each author treats Rawls's work would make an intriguing assignment for a graduate historiography seminar. 8 David Greenberg, “Hope, Change, Nietzsche,” in “The Book: An Online Review of The New Republic,” 26 May 2011, at www.tnr.com/book/review/reading-obama-james-kloppenberg?page=0,1. This review, too, came to my attention only as I completed final revisions of this essay. 9 Scott, Janny, A Singular Woman: The Untold Story of Barack Obama's Mother (New York, 2011). 10 Obama, Barack, Dreams from My Father: A Story of Race and Inheritance (New York, 1995), 27–8, 47, 48. * My thanks to Charles Capper and Ann Boyer for their helpful critical readings of earlier drafts of this review. 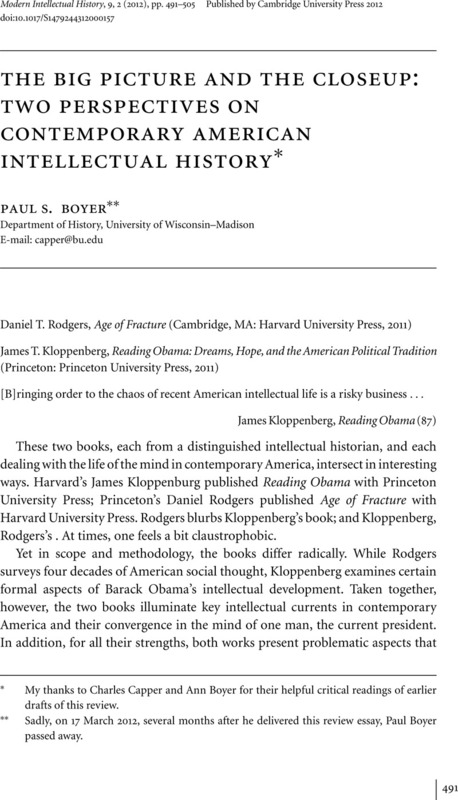 ** Sadly, on 17 March 2012, several months after he delivered this review essay, Paul Boyer passed away.